Herakles II feels fairly early. While doorways and stairs work normally, you still need to pick “speak” from the menu. Some towns do not have save spots, so you have to walk back to areas to save. The battle system looks a lot like a Dragon Quest style battle system. The graphics are pretty nice. In the short section I played, I did find an odd map design issue. At one point, you are looking for a guy in a graveyard. In the north of town, there’s a Red Cross style cross in the ground. Touching this teleports you into the graveyard which is larger than you would expect. The plus shaped area to the north contains a graveyard and a house. I wasn't expecting it to warp me to the graveyard. There is a day night cycle in the game (with changing elements in towns, and plot importance.) The graphics for this is pretty typical, and nicely done. One nice touch is that the night cycle enemies aren’t that bad to handle. Some games make it almost impossible to survive at night. 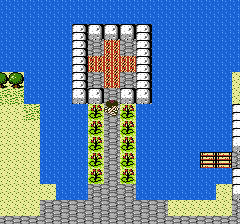 As for the grind, the game requires a 2 – 3 level jump for each new area. This seems pretty typical to me. I leveled up, went out from the third town, walked back, and walked around in the hills a bit. When I was low on HP, I was about five battles from another level. This seems a lot better then the grind in STED. Flicker unfortunately is hiding the enemies (Treemen, in this case.) They're about the size of the box containing Loki's stats. The battle cry varies from attack to attack. Plot wise, the hero is looking to stop the Titans. He chats up Homer, and gets a subquest to help an injured kid. 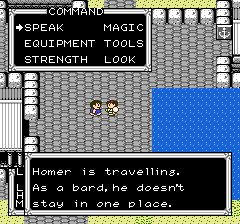 I’d say there’s more text than Dragon Quest II, but about the same amount compared to Dragon Quest III. I stopped before the first dungeon and boss, but I’m favorably impressed. I’m curious now what the other games in the series are like. As for the Greek mythological feel, I’d say the early game feels more like it’s using the names of familiar characters for flavor rather than trying to evoke Greece. However, there are a fair number of familiar names mentioned by the game. Here you can see how conversations work in the game. I’ve considered checking the series before, but I’ve never really gotten around to it. I own Glory of Heracles on the DS, and it was a neat game, but still pretty average overall, so I’m not sure if it’s a good representation of the series. From what I’ve heard about the series, it’s mostly pretty average. However, I think average stuff still can be neat if they’re competent. I think the game is more fun to play than STED, and faster to play then STED. Graphically, it’s early, but it’s not unpleasant on the eyes. 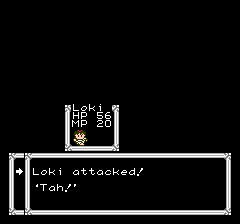 The battle system is fast, and the little battle cries are slightly amusing. The rate of getting poisoned (at least early on) isn’t too bad. 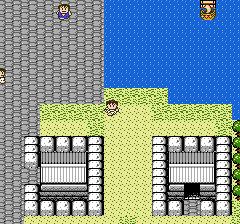 Compare this with say, Breath of Fire, where it’s more than likely that you will get poisoned in most battles. 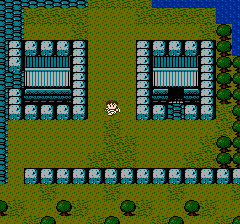 I guess a good comparison would be “Would a faster paced and better designed Dragon Quest II sound good?” If the idea of a Dragon Quest II with less design flaws, and a faster progression sounds good, you’d probably like the game?